Only four weeks remain for you to have your say on how water environments in the Humber river basin catchment will be looked after over the next 5 years. The Environment Agency set out plans for rivers, lakes, estuaries, coastal areas, wetlands and groundwater six months ago. Now there’s only a few weeks left to air your views on how else we can improve and protect the local water environments in Yorkshire. The water quality of our rivers, lakes and coasts has improved significantly over recent years, but there is much more that we can do. By commenting on these plans, you can play an important role in ensuring that our water environment continues to improve. Water environments provide many benefits including drinking water, an essential resource for business and agriculture, as well as providing transport links and social benefits. Since the first Humber River Basin Management Plan was written back in 2009, more than 66 kilometres of river and almost 920 hectares of habitats have been improved, and more than 150,000 trees planted. This has seen a greater abundance of wildlife and a reduction in the amount of chemicals in the water. 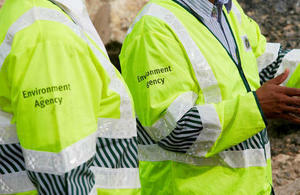 The Environment Agency has carried out more than 3,700 investigations to discover what can be done to improve any remaining issues. Write to: Jeff Pacey, Environment Agency, Lateral, 8 City Walk, Leeds, LS11 9AT.